Wow! Here we are at number 43 on Gourmet’s list of the 50 Most Influential Women in Food. The Game changers, and April Bloomfield certainly is a game changer! A few years later she was called by Ken Friedman who was looking for a chef to help him open a restaurant. He was hoping to get Jamie Oliver, who turned Friedman down. He recommended April, who he had worked with at the River Cafe. She came to the US and took a job for the summer working at Alice Water’s Chez Panisse, to familiarize herself with american ingredients. 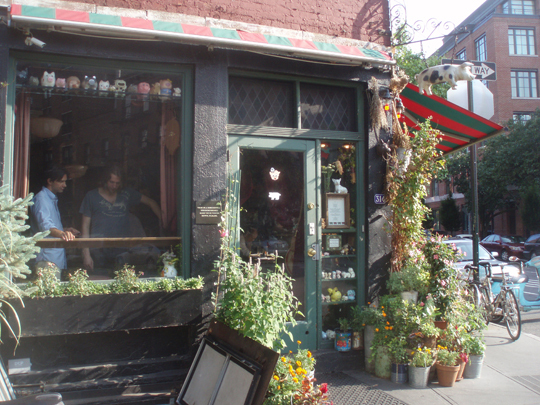 Then she headed to New York, where April (who is the executive chef) and Friedman opened The Spotted Pig. 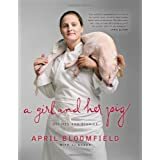 This week April Bloomfield’s cookbook "A Girl and Her Pig” hit the stores and I’m sure it will be a huge hit…just like April herself! I decided to make The Spotted Pig’s Deviled Eggs. I actually had an abundance of hard cooked eggs in my fridge due to the Easter bunny leaving way too many. What a great way to use them up! The recipe is quick and easy. These eggs were creamy, buttery, smooth and tangy….all the ingredients just came together so deliciously! Place eggs in medium saucepan and cover with cold water. Place over high heat, and bring to a boil, remove eggs from heat and cover the saucepan. Let the eggs sit in the hot water about 15 minutes. Drain eggs, and submerge in ice water. When cool, peel and carefully slice eggs in half. Place egg yolks in bowl of food processor. Add olive oil, mayonnaise, mustard, and both vinegars and process until smooth puree forms, scraping down sides of bowl as necessary. Season to taste with salt. Transfer mixture to pastry bag fitted with large tip or to plastic zip-lock bag with corner cut off. Select 12 best egg white halves (reserve remaining egg whites for another use), and pipe filling mixture into the eggs. Sprinkle eggs with sea salt, Peperoncino, and chives. Drizzle with olive oil, and serve. These are the very talented bloggers who are on the quest to blog through Gourmet’s list of the 50 Women Game Changers in Food…Make sure you stop by and check them out! I knew that April could take even a simple tried and true recipe like devilled eggs and bring it to new heights. Oh my those are tantalizing. Wishing I had more eggs - but these will get made. I had thought about trying to get into the Spotted Pig in NYC but the weather was not conducive to waiting out in the wind and rain! Ha! Great restaurant name, and such pretty deviled eggs! These deviled eggs look delicious and very lovely. I can't wait to try them:) Have a great weekend, Kathy. I've got a few too many hard-boiled eggs in my fridge now, too! This would be a great way to use them up. I enjoyed reading about April Bloomfield and I'll look for her cookbook. I made deviled eggs also! Weren't they good? I am so glad you shared this recipe with us. Hmm. I haven't made deviled eggs in ages, and your beautiful eggs are making me hungry! I'm glad you found the photo of the restaurant. I was imagining something else. Now those are some of the prettiest deviled eggs I've seen. Beautiful presentation! I was just reading about her new book earlier today! Your deviled eggs look wonderful, Kathy. I hope you have a lovely weekend! These deviled eggs look beautiful! I love the flavours. 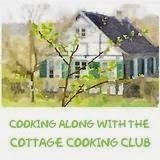 Kathy, such a fantastic recipe, and story; love reading the post, so interesting, and inspirational! I love how cute you piped those back in the egg whites!! Sound delicious. Wonderful recipe choice, Kathy! Deviled eggs are the first thing to go anytime they're served. Love this recipe...and going to try it soon. Super presentation! Love the looks for your eggs, I need to learn how to 'pipe' stuff like you do, I just slop it on with a spoon, tastes as good but doesn't look very pretty. You've done it again. Because of Easter I have so many eggs leftover so this is such a great idea to revamp them! Very pretty presentation! Your deviled eggs look delicious and really enjoyed reading your writeup about April. I'm so inspired by people who are will to work so hard to perfect their craft. What a neat project - it's hard to believe you're all so close to reaching the end of the list! I did skip the Sardine Rillettes (even the name grosses me out!). After reading Cher's account, I'm so glad I did! I suppose I could have made it with Tune, or some other fish, but I know we have a few more to get through, so maybe I'll have my courage up by then! I did make the Lemon Loaf Cake on Saturday - I thought it was okay. It was a bit dry, but I doused it with Limoncello Blueberry Sauce!